Corporate events, weddings, cocktail parties—whatever your event, the great caterers of Florida will help make it one to remember. Caterers do all the hard work, from cooking the food to preparing all the tiny details, so you can spend more time with your guests and less time organizing, planning, and cleaning. From family reunions and holiday dinners to baby showers and meetings and more, here are 10 amazing caterers in Florida. When you can partner with a caterer like Celebrations Catering, you’ll be looking for excuses to party. Their planners know how to make your event successful, handling every fine detail to make a lasting impression. Guests rave about the food taste and presentation, as well as the above-and-beyond service from the wait staff and chefs. Hands down, you won’t find a more dedicated catering company. 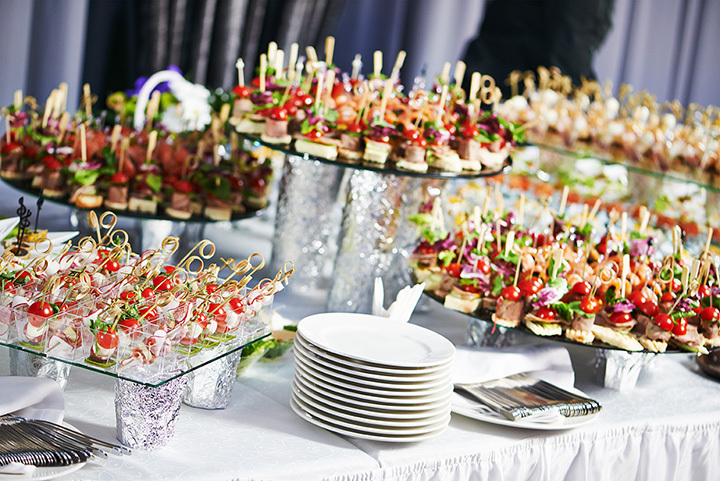 As their name implies, Affordable Catering is well-known for working with your budget to bring your vision to life. Their imaginative food dishes look every bit as good as they taste, offering some of the most top-notch menu items you just can’t find anywhere else. Fans love them because of their careful attention to both food and non-food items to give every event a unique edge. This award-winning catering company captures the true essence of South Florida cuisine. Here you’ll find no end to delicious dishes and creative concoctions that will make your spread one of a kind. They have their own lush event space, where they’ll graciously host you, or travel to wherever your party is going down. Grandiose events call for a caterer to match, and it doesn’t get any more elegant or regal than Eden. Their lavish ballroom is fit for royalty, offering the best ambiance in the area for star-studded events. They have extensive menus to fit every budget and diet, including a mouthwatering all-Kosher menu that’s packed with some of their most innovative food creations. Paella is in the name for a reason—it’s THE defining dish guests just can’t get enough of. This authentic Caribbean cuisine will leave your guests stunned and satisfied. Choose from fan favorites like the whole roasted pig or tapas, and make sure you order plenty of paella—your diners will demand it! Creating food is a work of art, and Simply Gourmet doesn’t take their responsibility lightly. They’re dedicated to creating inspiring dishes that will WOW your audience and make you look like a party hero. They partner directly with you to ensure your event is the best it can be, and you’ll be glad to have them in your corner. No event is too large or too small for Catering CC. They provide party platters of rich hors d’oeuvres, personal chef services on site, and everything in between to give your party the vibe it craves. Whether you need drop-off services only or full-scale catering, serving, and event planning, you’ve found the right caterer for the job. The A in A1 catering might stand for affordable, but it most definitely stands for Amazing! They know how to plan an event from the outside in, giving you plenty of food and flair to perfect your party. Make it as simple or lavish as you like—A1 Catering won’t disappoint on visuals, taste, or service. Arthur’s Creative Events and Catering have a knack for bringing the party to life. Their carefully-crafted dishes are usually the talk of the event, giving your guests every chance to savor the moment while enjoying some of the finest food and service in the area. Once you see how they can transform a room, you won’t need to look any further for your event partnership. With two locations in Florida, you can rest assured you’re partnering with a company who knows what Florida folks love. They’ve worked in over 200 local venues and have the logistical experience to prove it. From set up to clean up and everything in between, your guests will want for nothing. The warmer weather is finally here to stay! Luckily, our Chicken Lettuce Wraps pack all the flavor without all the guilt.